Progressive rockers Pink Floyd have progressed: from space, to the Atlantic Ocean. 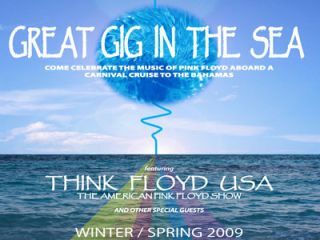 The Great Gig In The Sea is a Pink Floyd-themed cruise to the Bahamas, setting sail on 1 May 2009. Unfortunately, there'll be no members of the band present, instead, Think Floyd USA (the self-proclaimed "number one touring production of Pink Floyd in the country") will provide the on-board entertainment. This isn't the first jaunt of its kind, Mötley Crüe's Vince Neil launched the "four days of rock and roll on the high seas" that was Motley Cruise in January this year. The difference being that the Crüe were actually there. Still, if you're a Pink Floyd fan, The Great Gig In The Sea (Sky/Sea - see what they've done there?) promises "special guests, private parties, and numerous other Pink Floyd-themed experiences that will be one of a kind". We're definitely going, just so we can send a postcard home saying: "Wish You Were Here".